Protecting your skin from the ravages of time begins with daily use of a broad spectrum sunscreen and continues with an anti-aging cream. The best anti-aging ingredients for men include retinol, hyaluronic acid, and vitamin C.
When purchasing an anti-aging skin cream for men, it’s essential that you choose a product that corresponds to your skin type. Not that long ago, moisturizers and anti-aging creams were strictly for women. But times have changed, and while they generally won’t admit it, an increasing number of men are now slathering skin care products on their faces, too. Not all wrinkle-erasing treatments are created equal, though. Read on to find out which anti-aging products you should be adding to your skin care regimen. Whether you’ve already noticed lines and wrinkles starting to form, or you’re hoping to prevent them, dermatologist Jeffrey S. Fromowitz, MD, FAAD, in Boca Raton, FL, says that his first recommendation is the daily use of a broad spectrum sunscreen SPF 45. “Next is the use of a retinoid, which remains the gold standard for anti-aging, having passed scientifically validated clinical trials,” says Dr. Fromowitz. Despite the attraction to all things “natural,” Dr. Fromowitz suggests that if you’re looking to diminish the signs of aging, natural ingredients have their limitations. Retinol is a vitamin A derivative that unclogs pores, increases collagen, reduces fine lines, and smooths out discoloration. DMAE is an antioxidant membrane stabilizer and skin-firming ingredient. Hyaluronic acid contributes to collagen synthesis and helps retain the skin’s moisture. Vitamin C is a potent antioxidant that protects skin from sun damage. Tea extracts, notably green tea extracts, have antioxidant and anti-inflammatory properties that help ensure healthy skin. Coenzyme Q10 is an antioxidant that protects cells from the damage caused by aging and sun exposure. It also helps to reduce the appearance of fine lines and wrinkles around the eyes. Peptides are compounds that contain two or more amino acids linked in a chain. Peptides help to heal wounds and reduce stretch marks and wrinkles. Grape seed extract is loaded with antioxidant and anti-inflammatory agents. Niacinamide is related to vitamin B3 (niacin) and helps to improve the skin’s elasticity while simultaneously preventing skin dehydration. Methylsulfonylmethane (MSM), a chemical found in green plants, enables skin cells to remain absorbent and promotes skin elasticity. It also helps to reduce age spots and problems with skin pigmentation. Glycolic acid acts as an exfoliating agent to remove dead skin cells. When purchasing an anti-aging serum for your skin, it’s essential to first determine your skin type. Finding the right product for the right skin type, Dr. Fromowitz notes, is an important part of maximizing the benefits of an anti-aging skin cream. Normal skin – Most skin care products are suitable for men with normal skin. Sensitive skin – If your skin is sensitive, try to avoid protects that contain dyes and fragrances. Dry skin – Men with dry skin should consider products that contain retrinal or retinaldehyde, instead of retinol, as they are less likely to irritate. Oily skin – Oil-free, gel-based anti-aging serums are recommended for men with oily skin. Combination skin – If your skin is both dry and oily, the best choice is a cream free of harsh abrasives with a light amount of moisturizer. These seven products were specifically formulated to address men’s skin care needs, and are recommended by leading dermatologists. Brickell’s anti-aging formula emphasizes natural ingredients and is engineered to significantly diminish wrinkles, lines, crow’s feet, and other signs of aging. It contains natural and organic ingredients such as aloe, DMAE, MSM, and hyaluronic acid, as well as green tea, eucalyptus, and lemongrass oil, all of which add a nice aroma alongside other revitalizing properties. 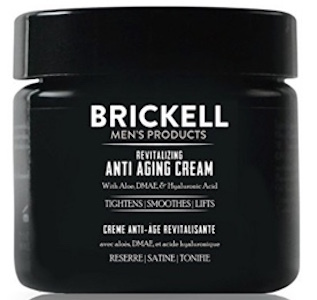 Brickell Men’s Anti-Aging Cream caters to thicker skin, typical of men, and the company pledges that fine lines will start to diminish almost immediately, while deeper wrinkles and other signs of aging will be significantly reduced over time. It’s an excellent option for all skin types, but it’s particularly beneficial for dry and sensitive skin, which doesn’t always respond as well to other anti-aging creams. Elemis Pro-Collagen Marine Cream for Men is an anti-aging cream formulated to hydrate and firm skin and to reduce the appearance of wrinkles. It was the winner of “Best New Aging Cream For Men,” in the 2017 GQ Grooming Awards and features a unique Mediterranean blend of algae that includes Padina pavonica (also known as “peacocks tail”), antioxidant-rich ginkgo biloba, and soothing AbyssineTM, a synthesized deep-sea microorganism. This product will improve your skin’s hydration levels. It also makes skin more elastic and supple, as well as silky to the touch. This revitalizing cream encourages increased collagen support, cell renewal, and provides a potent lifting effect. Visible improvement in skin quality, the manufacturer notes, can be noticed in as little as 15 days. 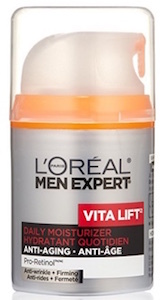 Suitable for all skin types, L’Oreal Paris Men Expert VitaLift Anti-Aging Face Moisturizer and Wrinkle Cream firms and moisturizes skin for up to 24 hours after application. It features Pro-Retinol A (a form of vitamin A) and Par-Elastyl (a petroleum-based mixture containing hydrocarbon molecules) to help hide wrinkles, lift sagging skin, smooth roughness, and moisturize. This patented formula protects your skin against irritation, ensuring less redness and burning, and includes a broad spectrum SPF 15 sunscreen that protects your skin from damage caused by exposure to the sun. 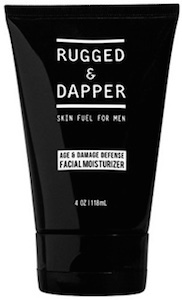 Rugged and Dapper Face Moisturizer for Men is a fragrance-free and chemical-free formula that soothes both weather damage and post-shaving irritation. Excellent for oily skin, it not only protects against aging but also reduces acne breakouts. It contains natural and nutrient-concentrated ingredients like botanical hyaluronic acid, aloe vera, jojoba, and shea, as well as an assortment of concentrated vitamins, minerals, and antioxidants. Nerium would like you to know that Nerium Age Defying Night Cream isn’t just for women. Men with skin damage caused by age, sun exposure, chemicals or acne stand to benefit just as much as women do from the use of this quality skincare product. Nerium suggests applying 4 to 5 pumps of the cream to your neck and face to rejuvenate your complexion and maximize the cream’s ability to hydrate, heal, and tighten your skin while you sleep. Loaded with essential skincare ingredients, including Nerium’s patented NAE-8 extract, derived from nerium oleander and aloe vera, this product is designed to inhibit damage from free radicals and trigger your skin’s natural cell renewal process. Neutrogena Age Fighter Anti-Wrinkle Face Moisturizer for Men is an oil-free moisturizer with broad spectrum SPF 15 sunscreen that helps reduce the look of lines and wrinkles while protecting your skin from the sun. Formulated with a healthy dose of retinol, conditioning multi-vitamins, and non-oily moisturizers, this product helps to soften rough, dry skin while reducing the appearance of lines and wrinkles. It is also an excellent sunscreen that will protect your skin from sunburns. Dr. Fromowitz recommends that men with sensitive skin might want to look for products that are less abrasive, noting that they should look out for products that promise to be “gentle” and “fragrance-free.” He says that Cetaphil in particular is a good product line for those with sensitive skin. 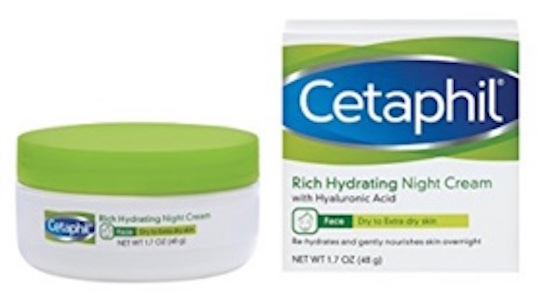 Cetaphil Rich Hydrating Night Cream boasts a superior system of extra-strength emollients and humectants that bind water to the skin in order to help reduce moisture loss. The non-greasy formula provides long-lasting relief, even when skin is dehydrated. Formulated with hyaluronic acid, olive extract, and a pro-vitamin complex (including vitamins E, A, and C), this creamy moisturizer protects from dryness for up 24 hours and leaves skin feeling soft, smooth, and supple. It nourishes skin, providing intense overnight hydration for normal to dry skin. The aging process can’t be avoided. But that doesn’t mean we can’t fight back. The battle against the aging of our bodies is based on a healthy diet, regular exercise, and avoiding dangerous habits like smoking cigarettes. When it comes to your appearance, arming yourself with sunscreen and an anti-aging cream gives your skin a fighting chance to stay healthy and youthful looking much later into life. » To find out which products are best suited to your skin type and needs, ask a cosmetic doctor for advice and schedule an appointment using Zwivel’s free online consultation tool.